concerned and also the alleged lover who had been coming there to meet Kevuma. Whatever it is, according to information she has given to people in that house ... still it has not been possible for police to get at her. Public support is warranted by police to arrest this suspect wanted by police and her photographs have been publicised while a police announcement too has been issued on March 14th. 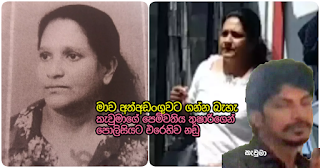 A request was made in the announcement to search for this 47 year old lady by the name of Mahauduge Don Nirosha Nilmini Perera alias Thushari. In any case, there is an attempt by her, who is presently in hiding to file action against police through lawyers, it is understood. Chief police inspector of Peliyagoda crimes division Mr. Linton Silva has told a newspaper that this lady has taken action against three police teams by complaining that trying to take her into custody is a violation of fundamental rights. The police inspector has informed that this lady is aware of a host of information regarding Madush and it is believed that crores of rupees earned by Madush and the house are under her name and that when an attempt is made to arrest her she has disappeared and has added that she is trying to file action against police with the motive of concealing secret information relating to the underground, which has been so reported.